The Sea Grant informs Minnesotans about the large coastal ecosystem in our state. Spotlighting research on the greatest lake in the world, this program shares how Lake Superior water research affects stream fishing, invasive species in Minnesota lakes, fish populations, water recreation, bio-diversity, water, health, and more. Sea Grant Files is funded in part by Minnesota Sea Grant, Ampers, and the Minnesota Arts and Cultural Heritage Fund. Spring is in the air....and in the water!! This week on the Sea Grant Files, host Jesse Schomberg and guest Emma Burgeson, discuss temperature changes, species migration, and the knife river watershed. "There is nothing so stable as change"
It's natural for lake levels to fluctuate...but when intense storms whip through, the power of water shows. The climate in Minnesota is changing. What will this mean for North Shore visitors on the hunt for recreational activities? Communication is key! Today on the Sea Grant Files, Jillian Farkas shares her experience as a Knauss Fellow and discusses how, and why, we need to apply science to policy. How is science being used in congress? "Science is being used, just maybe not at the level that everyone wishes it would be." Communities are gathering together to discuss what? Watersheds! On this weeks episode of the Sea Grant Files, our host Jesse Schomberg, discusses watersheds, how they affect the Duluth community, and why it is important to take care of them. Biogeochemistry; what is it and how have Lake Superior's storms changed its water? Ellen Cooney, a PhD candidate in Water Resources Science at the University of Minnesota, discusses her research on this topic with our host Jesse Schomberg. Jesse Schomberg and Tom Beery talk climate adaptation this week on the Sea Grant Files. Duluth is facing three major climate challenges: warmer and wetter weather, losing the winter cold, and more frequent and high intensity storm events. How do we combat these climate challenges and what does this mean for our community? What is a watershed and how do they contribute to flood efforts? Jesse Schomberg and John Bilotta, MN Sea Grant water resource management and policy extension educator, discuss watersheds and more, on this weeks episode of The Sea Grant Files. October doesn't just bring cooler weather and fall colors - October is National Seafood Month! If you're a seafood lover like our host, Jesse Schomberg, you may have known this already. For those that didn't, the more you know! 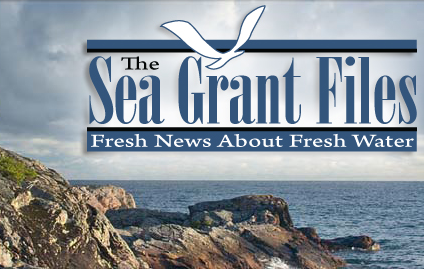 This week on Sea Grant Files, we're talking about fish population and how the limit on commercial fishing has affected it. This week on Sea Grant Files host Jesse Schomberg invites Dr. Chris Filstrup, an MN Sea Grant inland lake specialist, to discuss Algae blooms. Algae blooms are expected to become more common, more frequent, more severe, and more persistent. Why are they happening and can we prevent them, listen to learn more. Are there environmental concerns about Minnesota's wild rice sustainability? The Sea Grant Files host Jesse Scomberg shares environmental research and Native American history of the aquatic grass seed, otherwise known as wild rice. Listen for more about the scientific research around sulfide and wild rice in Minnesota. This week on The Sea Grant Files, host Jesse Schomberg has a conversation about aquaculture with Don Schreiner, Minnesota Sea Grant’s fisheries specialist. The Sea Grant wraps up their 2018 season with a focus on research happening in the Northland, like how beaver dams affect water flow and trout populations. Other work shared this week involves rip current safety research as well as advances in preventing zebra mussels hitching a ride on ships. The koi and goldfish that appeared in Bagley Nature Center's Rock Pond a number of years back were the tip-off that UMD had a situation to address.